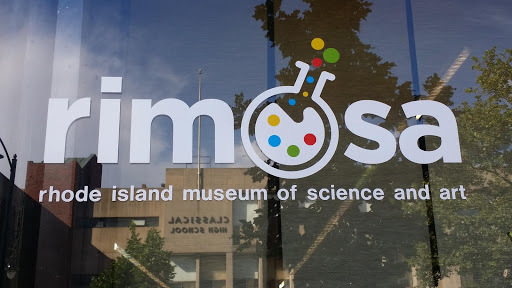 The Rhode Island Museum of Science and Art, (RIMOSA) became a 501(c)(3) organization in 2010. RIMOSA’s hands-on exhibits and programs emphasize the tools that both artists and scientists share; curiosity, observation, experimentation and communication. Our programs are designed to help participants see the world not as it is, but as it could be. lasts about 60 minutes, but can be adjusted to run longer or, somewhat shorter. can be offered as a one-time program or linked with others to create a cohesive experience which can run any number of weeks. The Rhode Island Museum of Science and Art wants to host your Special Event! Whether it’s bringing exhibits to you, or hosting the party at our Museum in Providence, we would love to celebrate with you! Looking to use our space? We can also rent out the facility to you! To schedule please email us at birthday@rimosa.org or info@rimosa.org to book! We look forward to hosting you soon! We have a parking lot at the rear of 763 Westminster. The entrance to our parking lot is on Dean St, right around the corner from our building. Coming from I-95, turn right at the corner of Dean St. and Westminster St, which has a Subway restaurant. The entrance to the parking lot will be the first left turn, the 3rd curb cut on the left. Drive through the first lot until you are behind a red brick building with green doors. You may park in spots designated for RIMOSA or Inspiring Minds. Entrance to the Museum is at the front, on Westminster. There is also street parking available at all times on Westminster. When school is not in session, you may also park in the Classical High School parking lot across the street from RIMOSA.